Physiotherapy Council Update Feb 2017: Healthcare Council Bill 2017: Physiotherapists, Dieticians, technologists and a host of other non-medical and non-dental professionals will gradually fall under the government’s regulatory net. 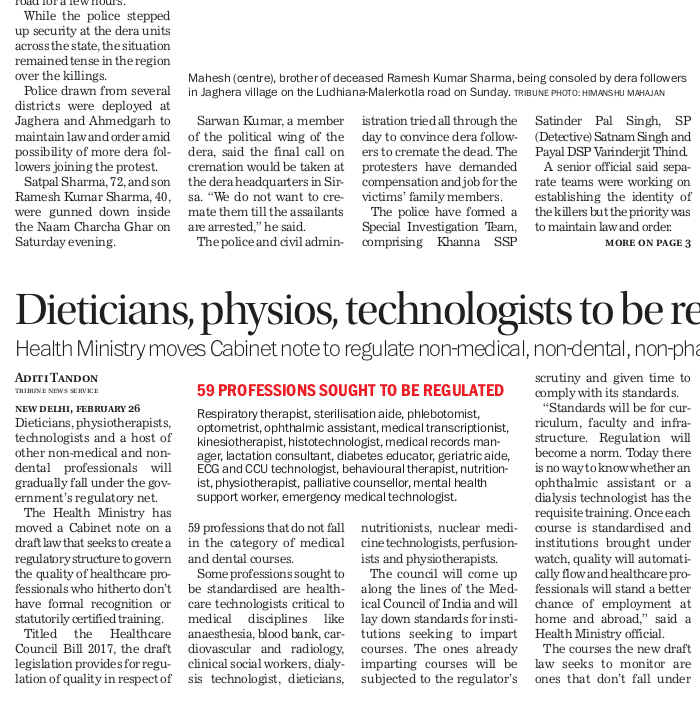 The Health Ministry has moved a Cabinet note on a draft law that seeks to create a regulatory structure to govern the quality of healthcare professionals who hitherto don’t have formal recognition or statutorily certified training. Titled the Healthcare Council Bill 2017, the draft legislation provides for regulation of quality in respect of 59 professions that do not fall in the category of medical and dental courses. Some professions sought to be standardised are healthcare technologists critical to medical disciplines like anaesthesia, blood bank, cardiovascular and radiology, clinical social workers, dialysis technologist, dieticians, nutritionists, nuclear medicine technologists, perfusionists and physiotherapists. The council will come up along the lines of the Medical Council of India and will lay down standards for institutions seeking to impart courses. The ones already imparting courses will be subjected to the regulator’s scrutiny and given time to comply with its standards. “Standards will be for curriculum, faculty and infrastructure. Regulation will become a norm. Today there is no way to know whether an ophthalmic assistant or a dialysis technologist has the requisite training. 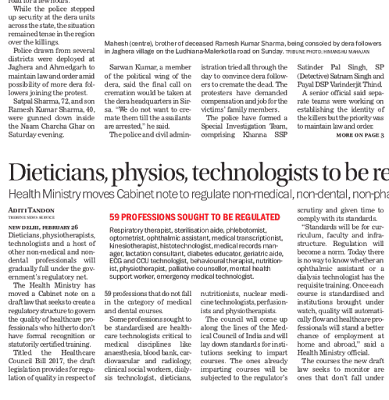 Once each course is standardised and institutions brought under watch, quality will automatically flow and healthcare professionals will stand a better chance of employment at home and abroad,” said a Health Ministry official. The courses the new draft law seeks to monitor are ones that don’t fall under the regulatory ambit of the MCI, Dental Council of India, Pharmacy Council of India, Nursing Council of India and Rehabilitation Council of India. Several universities today impart healthcare courses which are not recognised in the absence of statutory provisions. This leads to adhocism in the allied health sector, which is then exposed to related risks in terms of adverse health impact on the consumer of the service. “Unless a professional is certified, one can never be sure of the quality of service. The Bill seeks to fill these gaps,” a ministry source said. The name has been changed from the previously proposed "Allied Health Council" to "Health Care Council of India". That's a good news. Information is that Health Ministry is forming a separate board for Physiotherapy with Autonomous functioning.Also the recommendations of Thirty-first Report of the Committee on the Physiotherapy Central Bill 2007 have also been taken to our advantage. If that is the case, then we can welcome it to some extent provided Govt holds talks with the Physiotherapy Community and fulfills our basic demands before tabling it in the Parliament. In case we do not get Autonomous Status with Independent Board we have to keep fighting for Independent Council which is our dream for past 50 years. This update is a good step in favour of professional medicals. This is the need of the time. The separate courses should also be given accredited status.